Producer: Sure-Lox pieces. Company unknown – I do not have the box anymore. If you have this information, please do share. There were 4 puzzles in the box: Autumn in Paris, Buca Francesco, Rue Lafayette Paris, and Sunset Blaze – all by the same artist. 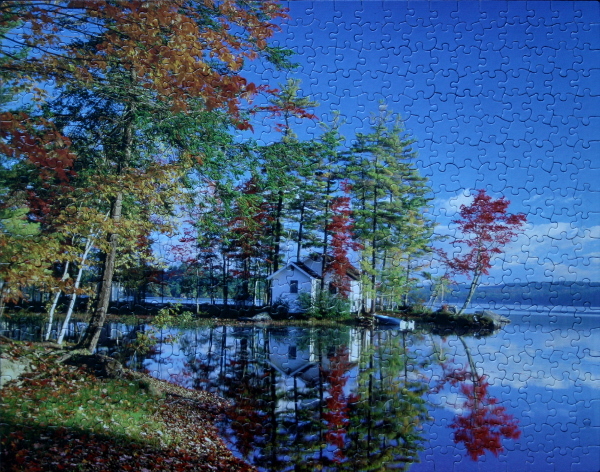 Puzzle: A beautiful puzzle, easy to do due to its small size and well-fitting Sure-Lox pieces. Great places to start are the red storefront with yellow letters, the beige and brown wall regions above, the Pharmacie banners, the blue store front on the crossing street, and the grey windows in the top right corner. 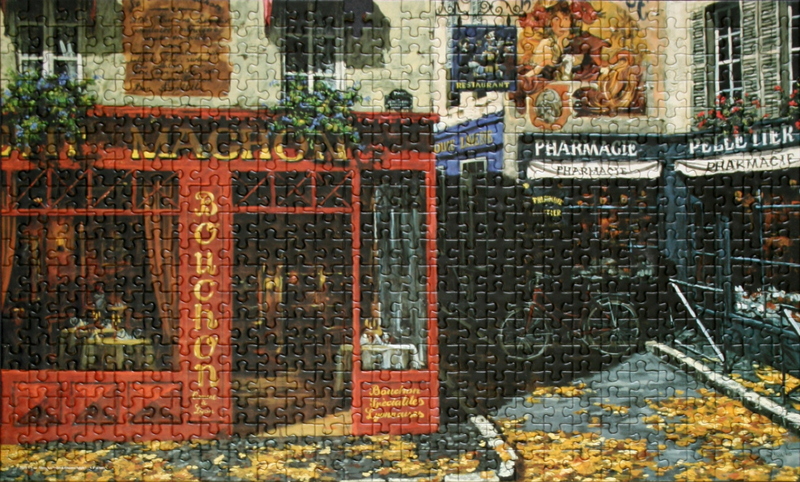 The pavement, yellow leaves, white pavement borders, and the painting above Pharmacie sign can be completed next, leaving the black Pharmacie store front, the windows above the red store front, and a few other small regions to complete the puzzle. 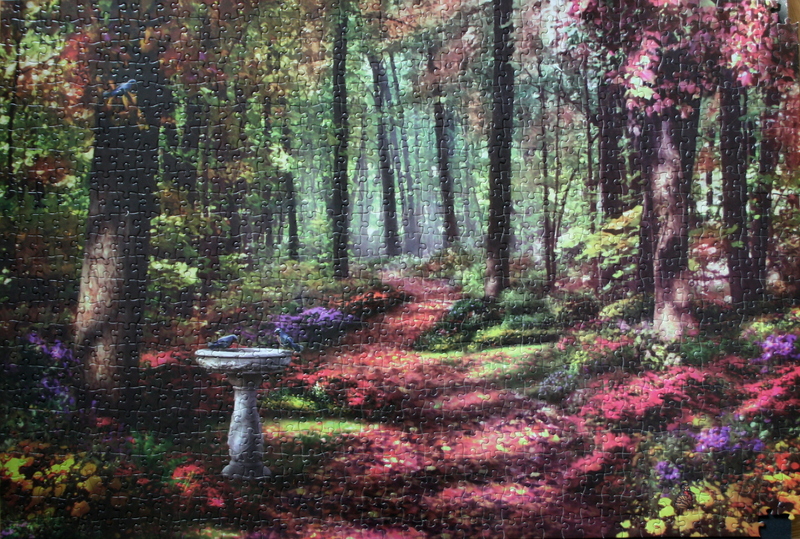 Puzzle: Not a trivial puzzle, but a calming one to do, listening to some zen music or a good narrative. I would say a good region to get started is the horizon line separating the snow from the water. This line splits the puzzle into two areas, providing a horizontal guide. 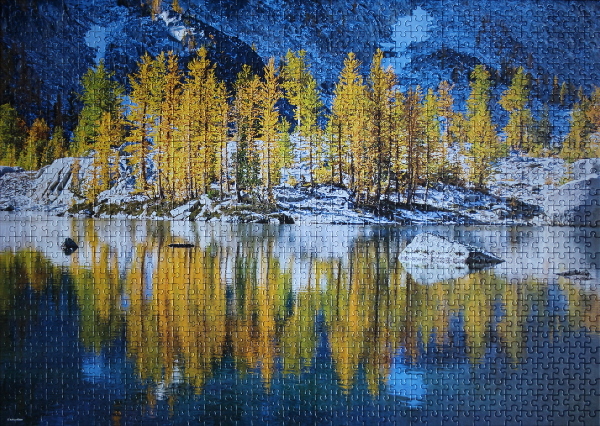 The darker blue regions in the corners of the puzzle and a dark rounded stone area in the top left, as well as the bright blue patches of snow on the mountain slope and their reflections in the water could be tackled next. For the trees, I found it easiest to start with the reflections in the water, as the ripples assist in determining the orientation of the pieces. The few rocks in the water and darker patches of land on the shore are distinctive as well. 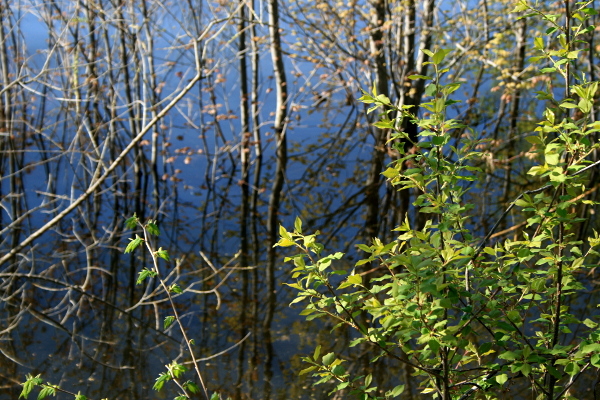 For the trees above water, tree trunks can serve as vertical guides. The gradients in the water, from yellow to blue, allow for gradual completion of that region, from light to dark. I have enjoyed this puzzle quite a bit. Puzzle: A beautiful painting bringing to forefront the issues of ecology, consumerism, and the police state. The artist explores the two sides of the coin: how we see the idyllic society and what it costs in the environmental damage and lack of freedoms. A fun puzzle to do, not very trivial for a beginner, mostly due to nearly-uniform colouring of the puzzle border pieces, and a large uniformly-patterned area in the bottom half. 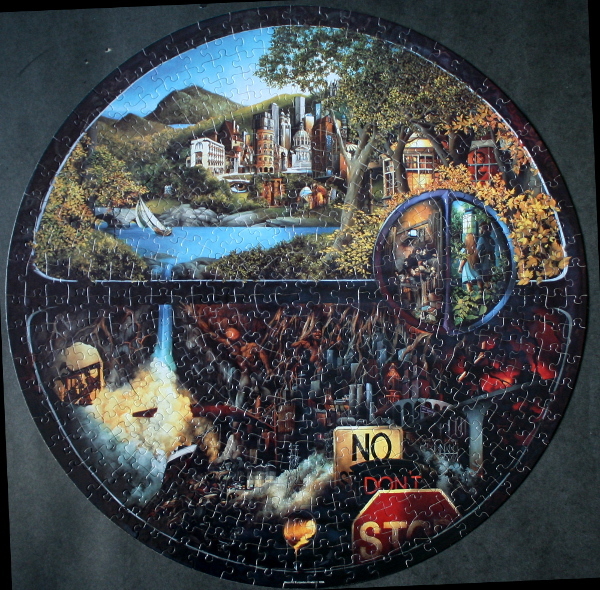 Easiest places to start are the “no”, “don’t”, and “stop” signs, yellow and blue outburst in the bottom left quarter, the horizontal separating black band between the top and bottom halves, and the smaller circle with two halves. In the top half, the sky and the sea, the sailboat, the tree and mountains bordering on the sky, and the red window are good as starting regions. The yellow leaves and the buildings in the top half and the smoke and brighter red and yellow spots are easy to distinguish. Once all these are in place, the puzzle is small enough to make the rest manageable. Notes: “The symbol for Ecology was created by Euripides; it was a simple circle with a single horizontal line through the middle. In this version of that idea the world is portrayed in two extremes: in the upper portion of the painting the world seems almost idyllic; proportional; and livable with breathing room, clean water, and real possibilities without apparent limits. 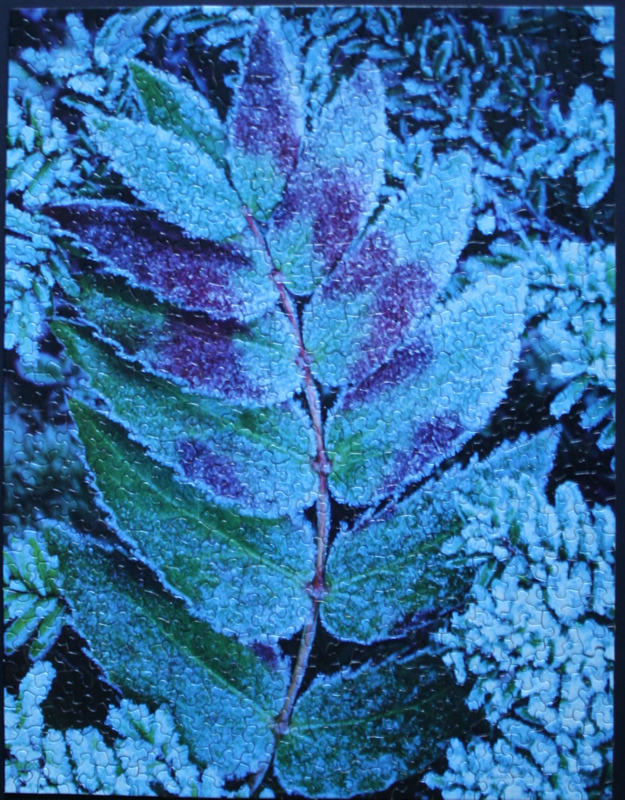 Puzzle: Not a simple puzzle to do due to similar colour patterns across the leaves, but very pleasant visually for its bright colours. 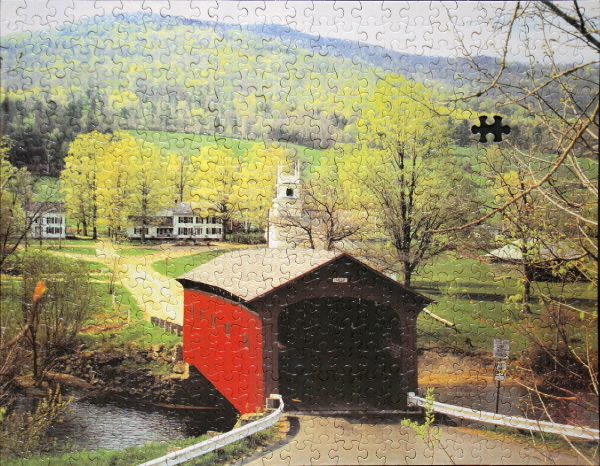 The difficulty is mitigated by the smaller size of the puzzle. A possible way to approach it would be to assemble the regions with stems first, as they are the most distinct, as well as the brighter areas of the leaves and the distinct leaf boundaries where possible: the centre leaf and the upper right corner are the easiest. From there the veins in the leaves help in assembling each one, with a few remaining pieces to fill in the gaps. Puzzle: I have used this puzzle as an example for my “How to do a jigsaw puzzle” post, so you can see the steps I used to assemble it there. 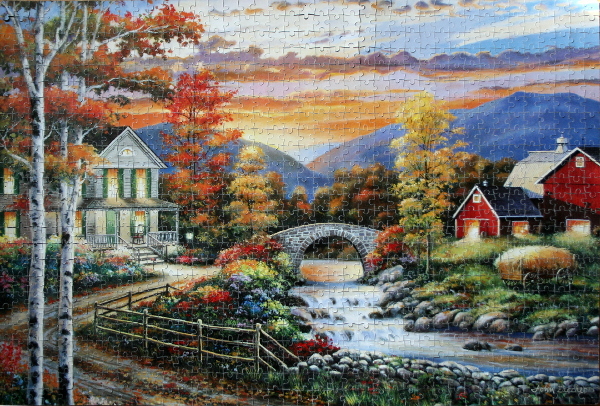 Overall a very pleasant puzzle, beautiful curves and deep colours. Not very trivial, but not extremely difficult either. Puzzle: There are several puzzles I have done of Havasu falls, and every time I find them breathtaking. This one is colourful and serene. The waterfall with the bright yellow leaves above it, the mountain ridges and their borders with other mountains and with the sky can be put together first and serve as the vertical and horizontal guides. The blue sky and a blue patch of water in the bottom left, the dark of the water under the waterfall, and the outline of the yellow tree leaves in the bottom half of the puzzle can be filled in next. The remaining regions are distinct enough to be completed without much difficulty. Puzzle: Simple enough to complete due to many differently-coloured regions, this puzzle is a quick one to do. The Sure-Lox pieces fit together snugly. One can start from the red of the bridge building, the beige and yellow regions of the roof and the roads, the black and brown of the bridge building, the white railings, the river water and the border between the mountains in the background and the sky. From that point on, the small buildings, the trees, and the remaining regions fit together easily. Whether your goal is to conceive, to avoid pregnancy, or to get in touch with your cycle, this necklace is a stylish personal way to keep track of your cycle and your fertile days. Beautiful leaf-shaped crystals mark the first day of the cycle, the infertile days following it, the fertile phase, the ovulation, and the luteal phase in different colours. 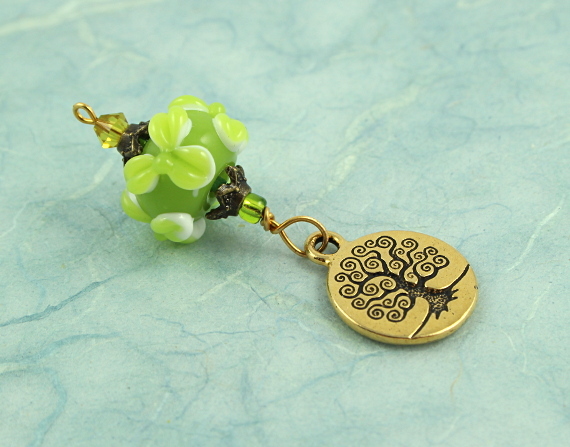 A movable charm is used to indicate the current day of the cycle. 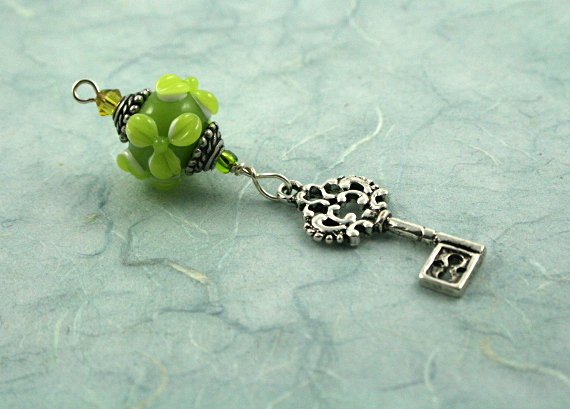 You can wear this necklace or keep it on a bedside table, on your desk, or in your purse. Take a minute each day to move the charm and focus on where your body is right now in its natural rhythm. The necklace arrives with an instruction card on how to use it. When ordering, please let me know your cycle length and ovulation day, and I will create a necklace based on your individual cycle. 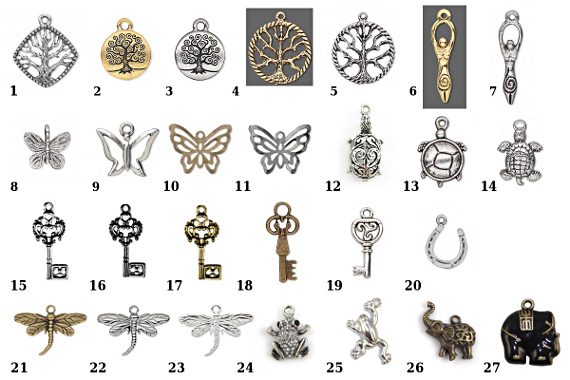 You can also pick a custom charm for your necklace from those pictured in the last photo. Please be sure to specify your ovulation day in a note to seller. Please allow 3-5 days for the completion of the necklace. See below for the shipping time estimation. 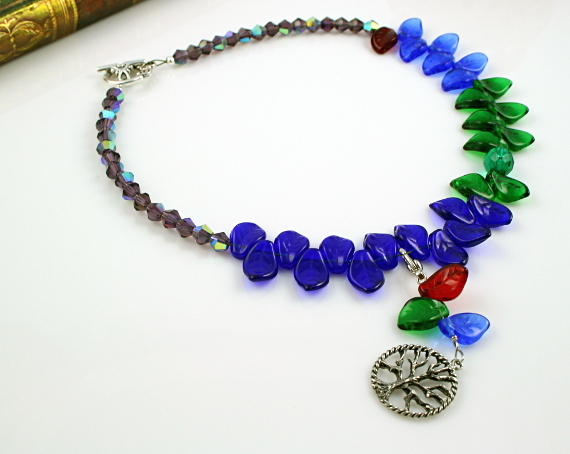 The sample necklace depicted above is based on a 28-day cycle with ovulation on day 14. First day of the cycle is indicated by a single red leaf, followed by 6 more non-fertile days, then 9 fertile days in green (7 days prior to ovulation and 2 post-ovulation), ovulation itself is marked by a larger crystal. 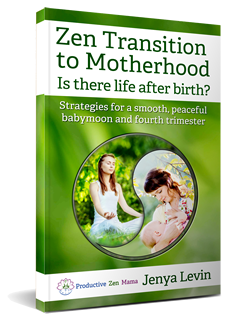 The necklace is completed by 12 non-fertile days of the luteal phase. 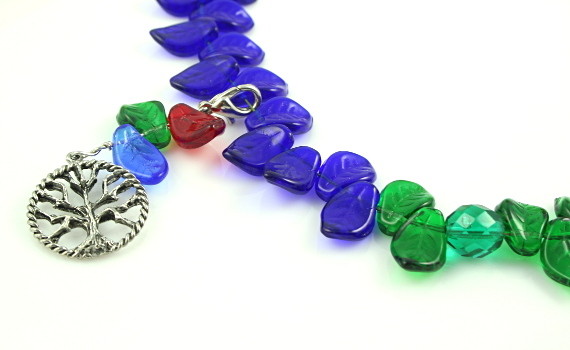 The smaller beads pad the necklace so it can be long enough for wear. The custom necklace will have the same design and colours adjusted for your cycle length and ovulation day, as well as the charm you have selected. 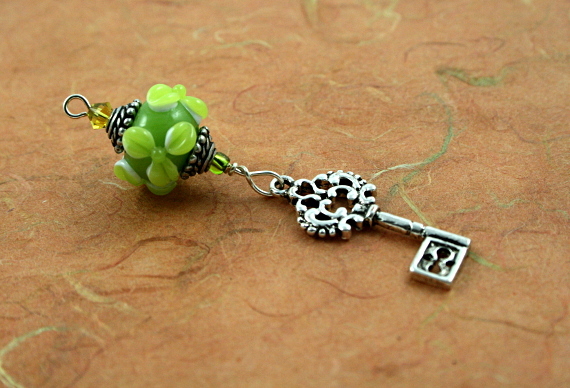 The sample necklace is about 15 and 3/4 inches (40 cm) long. The necklace length will differ depending on your cycle length. If you prefer a longer necklace, please message me and I can customize the length. Since the beads are fragile, I do my best to ensure that the packaging protects them appropriately. Do have a look at the other items in my shop to take advantage of combined shipping costs. Sign up for Veddma Creations newsletter at http://eepurl.com/LKBOP and receive 20% off your entire purchase at our Etsy store. There are more fertility items in my store: www.etsy.com/shop/veddma/search?search_query=fertility. 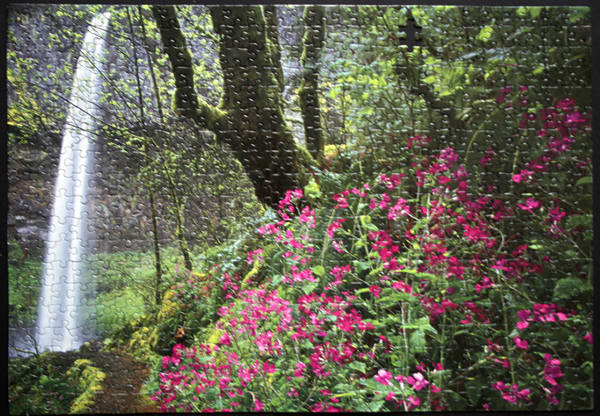 Puzzle: A bit more complex puzzle to do, but quite enjoyable. Good regions to complete first would be the birds and the feeder, as well as the tree trunks that provide vertical guides for the picture. The purple and yellow flowers, as well as the sunlit greenery in the middle can provide more spotlights. The rest of the regions are relatively equal in terms of complexity. Note: I do not have the box anymore, and thus not sure who the artist is. If you have that information, please let me know. Puzzle: A pleasant and easy puzzle to complete. The good regions to start are the sky (lots of horizontal guides there), the mountains, the tall red and yellow trees, the bridge, the river, the buildings, the birch trees, the cart with the hay, and the fence along the road. From that point on, the remaining pieces should fall into place easily. Puzzle: A serene puzzle to do, and being smaller with well-fitting together Sure-Lox pieces, is not too challenging. 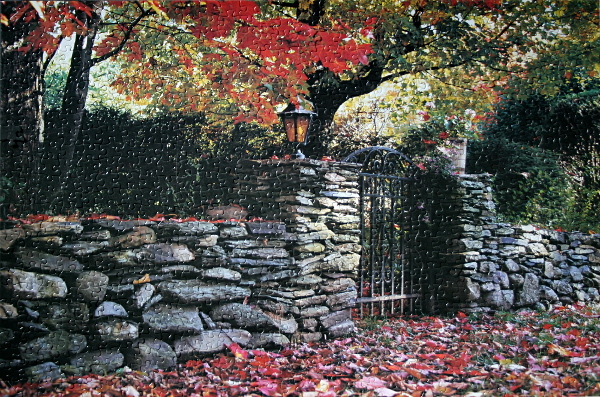 The red of the maple leaves on the tree, the lantern, the gate, the bright white/yellow regions of sunlit sky, and the wall with smaller rocks are good places to start. Once the wall is complete, tree trunks and leaves, as well as darker tree areas can be filled in. Puzzle: With so many bright intermingled areas it’s hard to suggest a single best way to approach this puzzle. 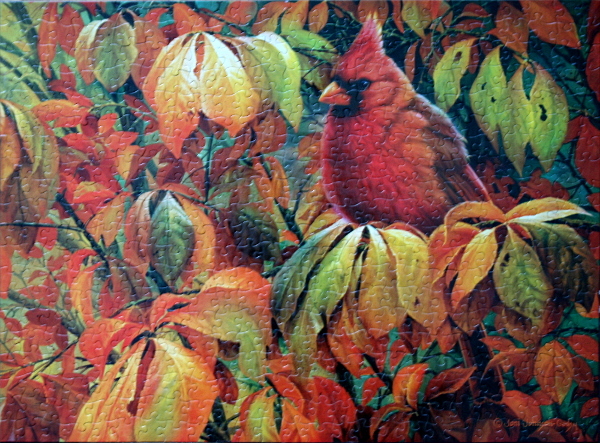 Certainly the bird, the distinctly green leaves on a darker background in the top right corner, and the darker areas in the bottom right can be used to start. 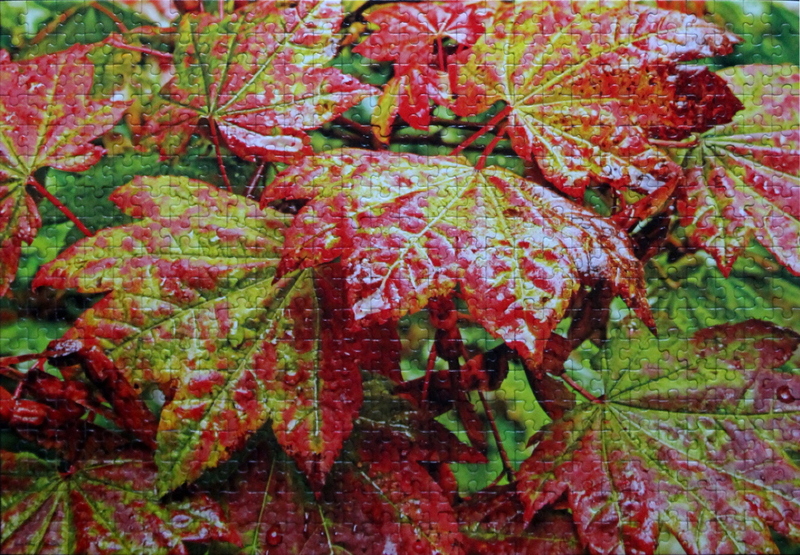 For the rest of the puzzle, it’s a matter of putting together the more uniform-coloured areas (brighter yellow, darker green, and flaming red leaves), and using branches as guides. 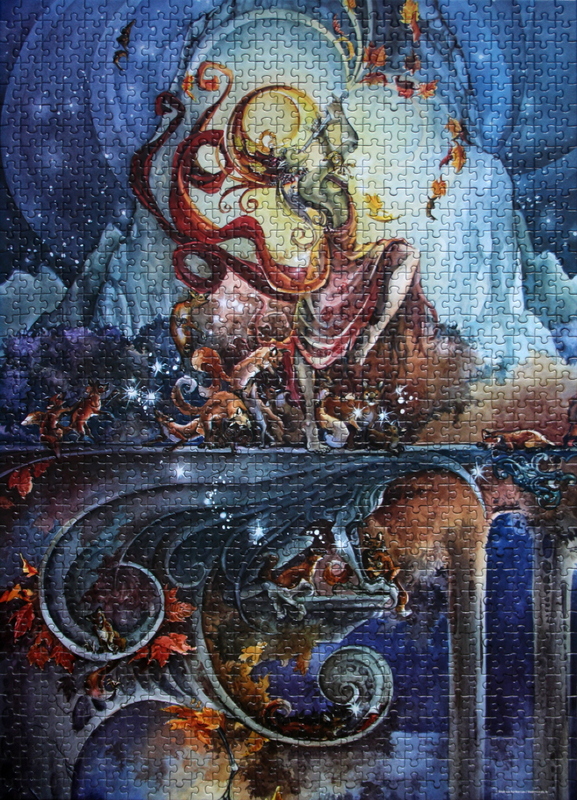 Quite an enjoyable puzzle to do. Puzzle: Colourful puzzle, relaxing to assemble at the end of a tiring busy day. 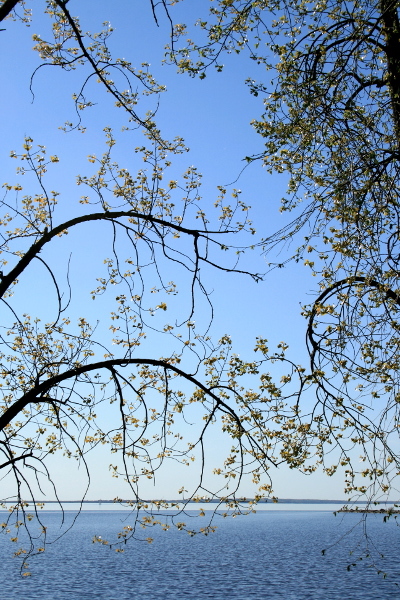 The sky, the water, and the house are easiest to start with, followed by the leafy bank and the red trees. The tree trunks can help assemble the rest of the trees, and the reflections are distinct enough from the trees themselves to be filled in easily as well. Notes: I do not have a record of the producer of this puzzle as I do not have the box anymore. A clarification is welcome – if you have any clue as to the details regarding this puzzle, I would much appreciate that information. Puzzle: The most logical starting point is the stem of the branch that has a distinct colour and splits the puzzle into two regions giving a central guideline. The purple leaf regions followed by the dark green ones and the light-blue and white ones are the next areas to attack. Black and dark purple patches , and out-of-focus branches are distinct enough as well. 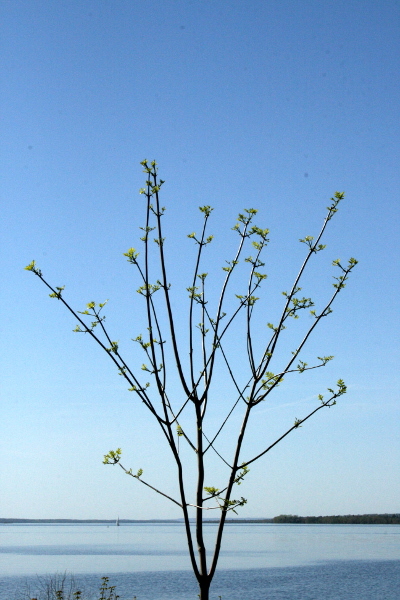 The remainder is somewhat uniform white and blue, completing the outside small branches. 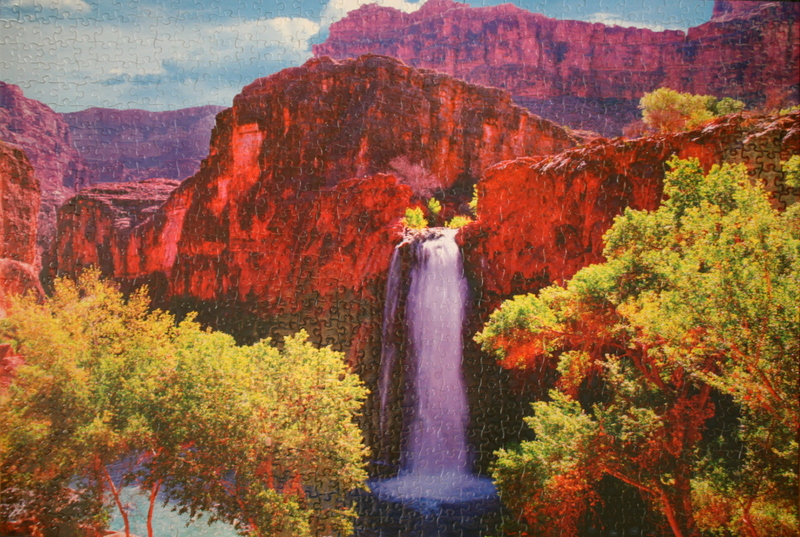 Puzzle: The waterfall and the tree are the logical places to start, followed by highlighted grass and leaves, the flowers, and finally by branch and leaf regions. Pleasant and not trivial. Gorge: A canyon, or gorge, is a deep ravine between cliffs often carved from the landscape by a river. Rivers have a natural tendency to reach a baseline elevation, which is the same elevation as the body of water it will eventually drain into. This forms a canyon.